Paris Saint-Germain had the advantage of a 2-1 home win over Chelsea going into the second encounter between both teams on Tuesday evening. Chelsea, however, needed only one goal to turn things around. With the Stamford Bridge crowd behind them, the Blues tried to stay cautious but were forced to intensify their efforts in defence. At the beginning, Guus Hiddink’s side sat deep, waiting for Paris to move the ball into Chelsea’s half. As they employed a 4-4-1-1 shape, with Diego Costa upfront and Willian behind him, it was tough to put pressure on PSG’s deep playmakers. The guests circulated the ball through their first lines with ease. Chelsea’s man-marking scheme limited the Blues’ options to react appropriately to the attacking patterns shown by PSG. Since the beginning of the season, Chelsea have been heavily struggling with a lack of compactness when defending deep. It was one of the major reasons José Mourinho had to leave the club. Mourinho’s philosophy has always included the intention to narrow the zones in front of the penalty box while setting up counter-attacks. Hiddink hasn’t changed this part of the Blues’ strategy, nor could he solve the issues. They are still struggling with the coordination of their defence. 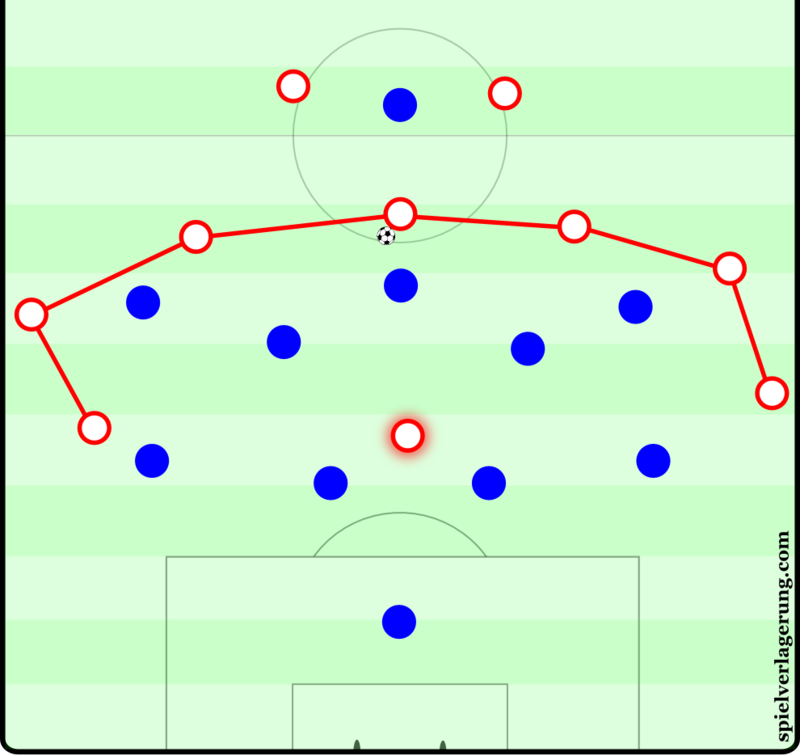 Prior to the first PSG goal in the 16th minute, Cesc Fàbregas, not looking over his left shoulder, chose to move towards the ball instead of covering Ángel Di María, who received a pass in the right half-space. Meanwhile, both Branislav Ivanović and left-back Kenedy rushed out of the back-line. The said lack of coordination made them pay, as Zlatan Ibrahimović moved behind Ivanović and Kenedy into a hole at the offside line while Di María slid a pass into his path. Gary Cahill, who was chosen to man-mark the Swedish striker, couldn’t decide whether he had to chase after Ibrahimović or protect the central area of the 18-yard-box. Cahill’s indecision not only gave Ibrahimović enough space and time to screen the field and play an accurate cross-field pass into the middle, but it also enabled Adrien Rabiot to charge into the penalty box and tap in the ball at the back post. In general, Chelsea had problems to get a hold of Paris’ attacking players. Ibrahimović often moved to the flanks, while Lucas Moura roamed through the zones in front of Chelsea’s centre-backs. Di María dropped back to be involved in the build-up play and to pick his spots when attacking plays unfolded. Those fluid movements created dynamism within PSG’s formation and made the opposing man-coverage pointless. It took a while until Chelsea realised they couldn’t continue with their conservative strategy in defence. If a team struggle with a lack of compactness, it is always an option to increase the degree of intensity when pressing. Then dynamism and positional shifts make it harder for the opposing team to move the ball forward without losing possession. With the hosts beginning to press with more intensity and higher up the pitch after 20 minutes, PSG became increasingly vulnerable to the pressure applied by Chelsea. Laurent Blanc’s side can shine when they are the dynamic part of a duel. But once they have to form a static defensive shape and only move laterally to follow the ball, it is difficult for them to shut down the passing and driving lanes in the middle of the pitch. Plus, holding midfielder Thiago Motta tended to lose the ball fairly quickly when he was pressured by Chelsea players. In the 27th minute, Motta turned the ball over in midfield, as Pedro explosively attacked him coming from the flank. At the end of Chelsea’s quick transition play, Diego Costa escaped his marker and stood in front of Kevin Trapp who couldn’t prevent the equalising goal. The hosts slowly took control over the match. PSG were able to bypass Chelsea’s pressing lines only a few times until the hour mark. Their attacking structure didn’t fit the problem presented to them. When moving the ball through deep zones, Thiago Silva and David Luiz couldn’t find open men without risking immediate turnovers. 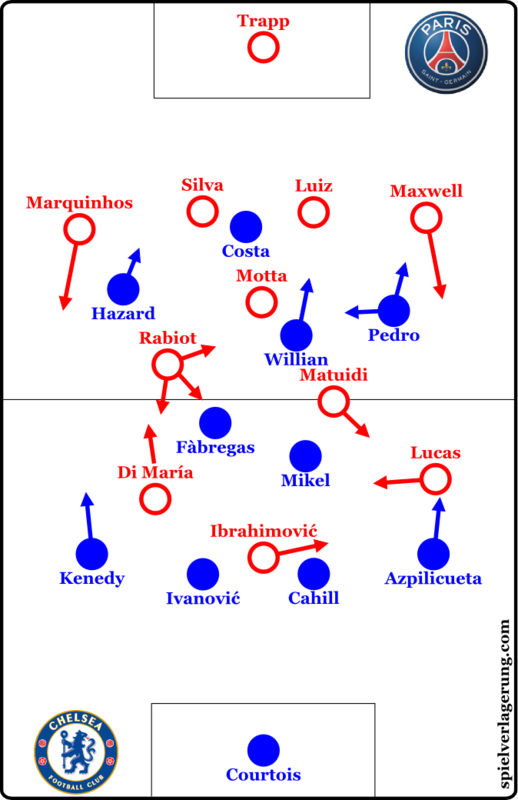 Or PSG found gaps in between Chelsea’s lines, but were outnumbered when they reached the final third, because the guests’ full-backs and midfielders were more hesitant than in the first phase of the match. 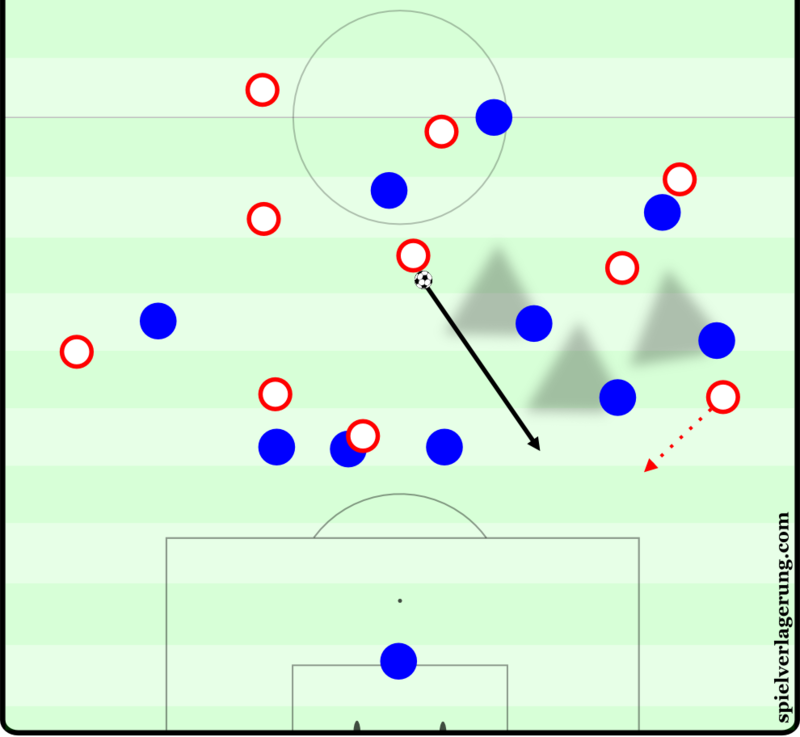 In response, Paris’ wingers started to position themselves near the sidelines in the build-up of attacking plays. The adjusted structure left Ibrahimović alone in the middle. The guests formed a U-shape around the opposing formation, which is always a bad sign. However, Chelsea couldn’t maintain the pressure. After the hour mark, they began to fade and once again sat deeper with a reactive man-marking scheme. At the same time, Bertrand Traoré had to replace the injured Diego Costa, which, of course, diminished their strength in attack. As if this wasn’t enough, in the 68th minute Guus Hiddink’s players made that one mistake that gave PSG the opening the guests were looking for. After Di María misplaced a lateral pass, Chelsea lost sight of the Argentinian winger for a second, because the Blues were thinking they could start a counter-attack. However, Motta was able to pick up the ball and play a pass through the left half-space, while Di María made a run behind the opposing backline. The 28-year-old’s cross found Ibrahimović who tapped in and destroyed Chelsea’s hope of progressing to the next round. While Thiago Motta, the supposed pivotal point of the PSG midfield, mightily struggled, Rabiot stepped up and delivered a great performance in the absence of the injured Marco Verratti. Of course, the 20-year-old didn’t dominate the match in a way Verratti could have, but he showed good patience even when Chelsea strongly pressured PSG’s build-up play. Moreover, Rabiot displayed effective motions and a great sense of spaces in defence. Even though Hiddink fielded the offensively-minded Brazilian Kenedy as left-back, the youngster had to wait 44 minutes before he could make his first deep run upfield. After the half-time break, Chelsea’s players looked more mobile in possession and the likes of Willian and Eden Hazard felt more comfortable in tight pockets in opposing territory. Meanwhile, Pedro tried to assist Fàbregas with the build-up play. As opposed to the first half of the season, Ibrahimović now interacts with his team-mates more sophisticatedly. The 34-old-year focuses less on individual actions and more on creating combination plays as well as on opening up lanes for midfielders or wingers to exploit. The Swede scored the deciding goal at the Stamford Bridge and his dream of the first Champions League crown is still alive. I can’t wait for this season to be over and we can move onto next year. I can’t really imagine a year with no european football but I suppose I am going to have to get used to it. Liverpool were not in Europe a few years ago and they should have won the title so I suppose it might be a blessing in disguise. We need a full time, experience manager. I think Conte would do a great job. Roll on the 2016/2017 season!